IP Office, back in the day, used to use TAPI to allow users to dial from Outlook Contacts. Now that Microsoft has entered the voice telephony, they have enhanced capabilities in their products. 1. In the Tools menu, select Options. 2. Click the Mail Format tab. 4. Click Proofing, and then click AutoCorrect Options. 5. Click the Smart Tags tab. 6. Enable Label text with smart tags check box. 7. Select Avaya IP Office smart tag listed in Recognizers. 8. Enable Show Smart Tag Actions buttons check box. 1. Select File > Outlook Options. 5. Click the Actions tab. 6. Select Enable additional actions in the right-click menu check box. 7. Select Avaya IP Office smart tag listed in Available actions. In the categories pane, click Add-ins. In the Manage box, choose Smart Tags and then click Go. Select the Label data with smart tags check box. Now that we have that set, you need to install the IP office One-X Portal Desktop clients. Those are downloaded in the One-X portal web page by going to the Configure tab, then Desktop Integration. 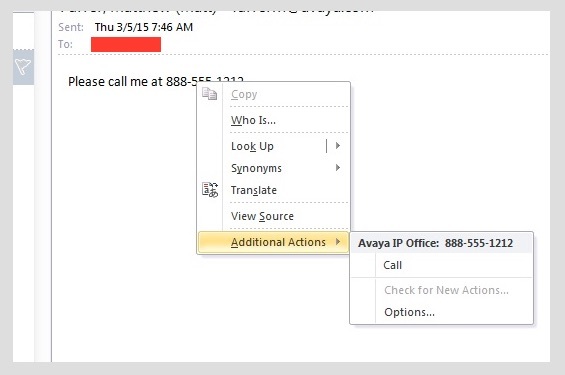 There you will see three sections, Prerequisites, Avaya IP Office Plug-In for Microsoft Outlook & Avaya one-X Call Assistant and Avaya IP Office Plug-In for Salesforce.com. Obviously install the prerequisites first, then the desktop clients. Once they are installed and sync up to your IP Office/One-X Portal, you are ready to try the Smart Tags options. In outlook, you may see a phone number in the email or in the signature. All you need to do now, is right click on the number, and you will get a drop down box. Thats it, select the Call option and your phone will dial out to that number.